Parenting is tough. It’s a complicated dance that includes steps called Love, Discipline, Challenge, and Acceptance. When we fail as parents it’s usually because we’ve become too good at one of the steps and underdeveloped in another. Getting it right is mastering the tension between loving unconditionally and yet still nurturing little people the rest of the world will want to be around. It takes work and a good amount of grace. For many reasons, the difficulty level of this dance seems to increase when you parent a child with special needs. It isn’t technically harder, of course, but it is different. In our case, we’re constantly second guessing ourselves when it comes to parenting Claire. Most of you know her story. 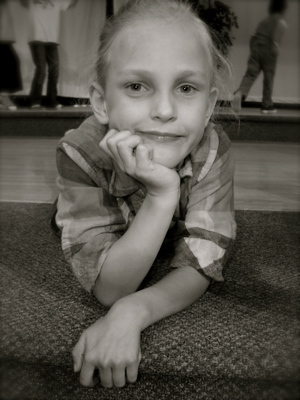 She has mild cerebral palsy and she’s so good at adapting that too often we forget she isn’t a typical middle child. Other times, it is only too clear with Claire that we’re not dealing with a child facing the usual problems and obstacles. This is especially true whenever she has an evaluation or milestone, and it was one of those weeks. First, I stood at the rehab clinic and talked with her physical therapist while we watched Claire walk up and down the hallway. She has hemiplegic CP which means most of her weakness/tightness is on one side, her left. Since our bodies are meant to work symmetrically, this causes many physical problems for Claire. We talked stretching and muscle-building and Botox and exercise. It’s always tempting in those conversations to feel like I haven’t been doing enough or to despair that we’ll never “fix” the problems. And it’s true. Years ago at a visit to one of her specialists, we overheard the parents in the chairs nearby working together to fill our the paperwork that asks about the patient’s history. It turned out their daughter was just a bit younger than Claire, born at the same gestation [25 weeks] and with many of the same complications. The difference was, our daughter was toddling back and forth to the magazine rack bringing us things to read and their daughter was staring off into space strapped into an electric wheelchair equipped with a ventilator that kept the little girl breathing. That could have been our reality. Instead, we’re “tweaking” her walking/running gaits and reminding her to use her left hand to help with daily tasks even though it would rather just hang tight at her side. We’re trying to figure out how to help her catch and throw a softball and how to spin in time with her classmates in the school musical. Remembering where we could be helps me relax about where we are. Then it was also IEP week, which meant I met with the special education coordinator to discuss Claire’s recent evaluations and how they will impact her educational plan. I’ve been bothered by her IQ score, frustrated that it didn’t match with what I saw in her mind and in her academic achievements, so I had requested that she be retested. I just knew the new score was going to prove that I was right. I was wrong. The new score was actually a little lower than the first one. I fought my disappointment as we continued working through the results. Some of it is so heartbreaking, like the fact that my nine year-old tests with the physical abilities of a four year-old. That explains a lot of her frustration. And imagine the body of a four year-old doing the school work of a third grader. But some of it was encouraging. There is still no sign of a learning disability. This is determined by matching her abilities – what she is capable of doing – against her performance – what she is actually doing. In a child with a learning disability it is determined that their academic performance does not match up with their abilities. In these cases teachers try to determine what kinds of things are standing in the way and help the child to overcome them (for example, reading test questions and allowing the student to speak his or her answer instead of writing it down). Claire has never tested with learning disability because it has been determined that even though her academic performance has been below average, she is working at the top of her abilities. When I first learned that, it was not reassuring. I didn’t want failure to be the top of her abilities. But this time her testing showed some different results. In every academic area except for one (math), Claire performed as “average.” Which means that the only area where she is working at her ability level (which is below average for her age group) is in math. In every other area she is working ABOVE her ability level. And this test was administered by an external specialist using a test not related to Claire’s own schoolwork. So it isn’t that she is just getting special treatment at school or anything. She is literally performing beyond what she is technically capable of. So what is that? The opposite of a learning disability? I don’t know, but I do know it is a great way of describing Claire. It also reminds me of why the parenting dance with her is so complicated. Just when I think she isn’t able to handle the routines, she does a flying leap across the floor in perfect pace with the other dancers. Yet then when I push her to finish a math review worksheet on her own, I find her still working an hour later and remember that subtraction – for some crazy reason – is harder for her to process than multiplication. The steps are out of sequence, we’re learning as we go, and the music doesn’t always match the costume. But we’re dancing. And we’re having fun learning. And no one else really knows what any of it is supposed to look like anyway. I think I’ll remember that and just call it art. I might not be able to explain it or replicate it or teach anyone else how to do it, but good art doesn’t have to do any of that. Art just is, and we enjoy it and learn from it and let it make us better people in ways we don’t even understand. Just like parenting. I had tears when I got to the part about her working above what she is technically capable of. And this is so powerful, parenting as art instead of a formula. “But we’re dancing”….is where the tears formed. For me. I love that you share how Claire is doing with us. Oh,the memories and frustrations! It was always so hard at times to focus on what mattered and what was not that important in the long run. I dreaded Evans IEP’s for that reason. I have found, since he is an adult, that testing is no longer important & his actually skills and strengths are what count. Still, I feel for you all!! Hugs from here to there. I love your dance. You do it so well. And, art… of course! What a perfect description. Training a child in the way she should go is all about nurturing the art, isn’t it? So proud of Claire. And of you. I literally was watching Claire during church the other day and thinking that it’s hard to remember that she shouldn’t be doing the things she’s doing, but by God’s grace she is. It is only by God’s grace that any of us do anything, but in Claire’s case it is such a special gift. Thank you for this post and the life you and Dan are giving Claire (and Jesse and Ada and Macy)!!! Claire is one of the most beautiful and graceful dancers I have ever seen. More proud of her than I can express (can’t see the keys anyway)!!! God gave all of us Claire to remind us, just like Carol said, that it is by HIS grace any of us do anything…..but Claire is the visual aid…..I mean she glows! high school classmate of Grandpa Don’s & I’ll share your story w/friend who has child w/apraxia (sp?). She’ll appreciate knowing there are other loving parents out there just doing the best they can do EVERY day & praying they don’t get discouraged. WE pray for ALL of you ! Thank you, Lonna! Any friend of Papa Don’s is a friend of mine! I hope your friend will be encouraged and thank you for the prayers. Thanks, Hannah! I couldn’t be happier with the whole Elrod/White merger myself. We’re destined for each other, apparently! And thank you for the prayers now and way back then. God must have been showing you that picture to give you the right prayers: for our comfort and a sense of His control despite the circumstances. It worked. We felt every ounce of those things. I love this post. It is so difficult to articulate the emotions of parenthood, but you do a beautiful job of it!